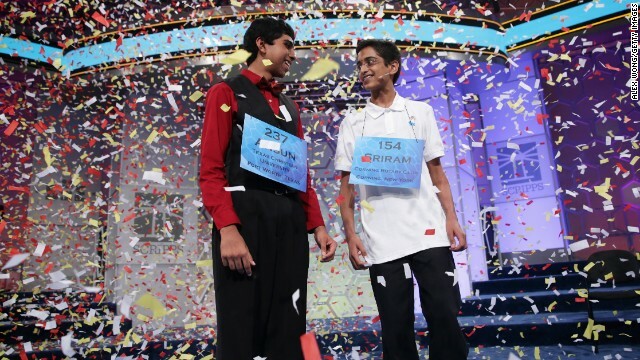 President Barack Obama tweeted praise to the "incredible co-champs"
(CNN) -- Sriram Hathwar and Ansun Sujoe correctly spelled so many words Thursday that the Scripps National Spelling Bee had to declare them both winners. In the bee's final round, Hathwar, 14, an eighth-grader from Painted Post, New York, correctly spelled the word "stichomythia" -- dialogue especially of altercation delivered by two actors. 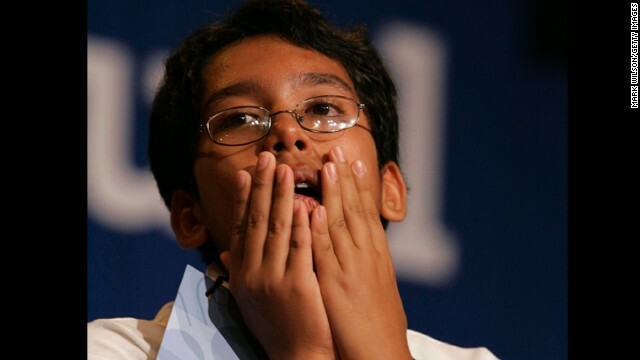 Sujoe, 13, a seventh-grader from Fort Worth, Texas, correctly spelled the word "feuilleton" -- part of a European newspaper. 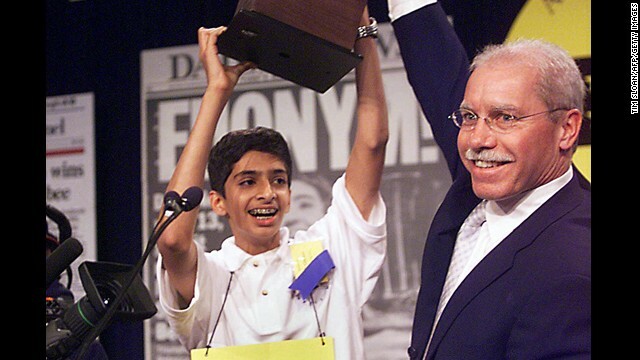 Ansun Sujoe, left, and Sriram Hathwar became co-champions of the 2014 Scripps National Spelling Bee competition Sujoe spelled the word "feuilleton" and Hathwar spelled the word "stichomythia." They both spelled their words correctly as they exhausted the words on the bee's list, becoming the first co-champions since 1962. 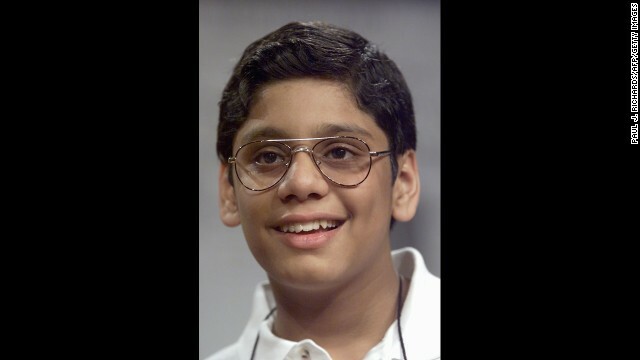 Arvind Mahankali won the 2013 Scripps National Spelling Bee after spelling "knaidel," which is a dumpling. Click through to see the rest of the winners from the past 15 years. The definitions of their winning words are from the Merriam-Webster dictionary. Snigdha Nandipati won in 2012 with the word "guetapens," which means an ambush. Sukanya Roy won in 2011 with the word "cymotrichous," an adjective that means "having the hair wavy." Anamika Veeramani won in 2010 with the word "stromuhr," which is an instrument that measures the amount and speed of blood flow through an artery. 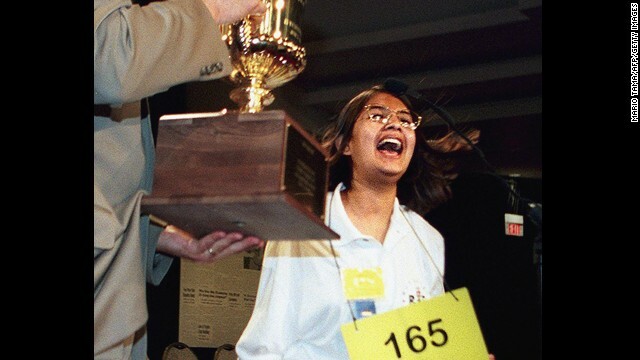 Kavya Shivashankar won in 2009 when she correctly spelled "laodicean," which means lukewarm or indifferent, particularly in matters of politics or religion. Sameer Mishra won in 2008 with the word "guerdon," which is a reward or recompense. Evan O'Dorney won in 2007 with the word "serrefine," small forceps used for clamping a blood vessel. Katharine Close won in 2006 by correctly spelling "ursprache," a language that is reconstructed from evidence of later languages. Anurag Kashyap won in 2005 with the word "appoggiatura," a smaller embellishing note or tone that precedes a melodic note or tone. David Tidmarsh won in 2004 with the word "autochthonous," an adjective that means indigenous or native. Sai R. Gunturi won in 2003 with the word "pococurante," meaning indifferent or nonchalant. Pratyush Buddiga won in 2002 with the word "prospicience," which is the act of looking forward or having foresight. 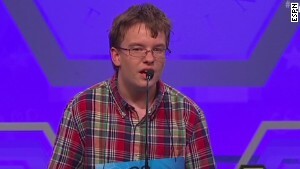 Sean Conley won in 2001 with "succedaneum," defined as "a substitute." George Abraham Thampy won in 2000 with the French word "démarche," meaning a course of action, typically in politics. Nupur Lala won in 1999 with the word "logorrhea," meaning excessive and incoherent talkativeness or wordiness. Jody-Anne Maxwell won in 1998 after correctly spelling "chiaroscurist," which is an artist who specializes in chiaroscuro, or contrasting the effects of light and shade in a work of art. Spelling bee runs out of ... words? "It feels pretty good because not only do I get the victory, but I get to share it with someone else, so it means a lot to me," Sujoe told CNN's "New Day" on Friday. Hathwar called the English language "brutal" because it incorporates words from other cultures and languages. "So it was really a competition against the dictionary, and not against Ansun or any of the other competitors," he told CNN. 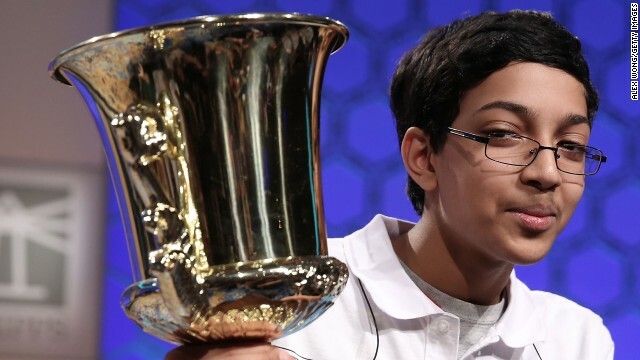 The two quickly garnered praise from high office, with President Barack Obama tweeting his kudos: "Congrats to Ansun and Sriram, the incredible co-champs of the #ScrippsNationalSpellingBee. You make us all proud! 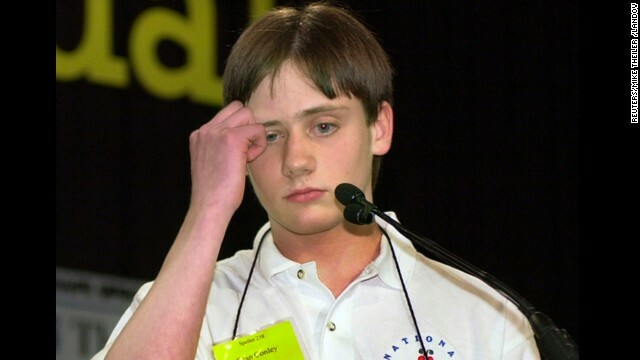 -bo"
In this year's national championship, 281 spellers from eight countries competed for the title. The contest started Tuesday and finished Thursday night with the finals broadcast live on ESPN. Sujoe told ESPN that he got hooked on the bee by watching it on television. In addition to spelling, he has perfect pitch and plays piano, bassoon and guitar. "I was pretty happy when I made the finals, and now I'm even happier that I'm a co-champion," Sujoe said. 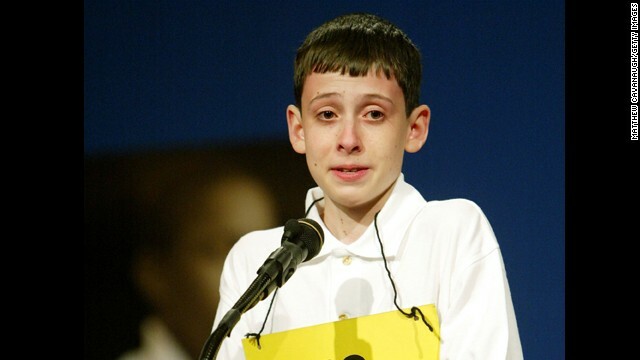 Hathwar, who placed third in last year's competition and first made it to the National Spelling Bee as a second-grader in 2008, was a favorite to win this year's contest. The youngest competitor this year was 8. And the oldest was 15, organizers said. Even students who didn't walk away with a trophy seemed excited about their next steps. Tejas Muthusamy, 11, said he'd return home ready to change his studying routine for future competitions. "Now I'll prepare more for the finals, and try to go through more esoteric words," Muthusamy said, minutes after misspelling "hallenkirche" got him kicked out of the competition. Eighth-grader Kate Miller, who struck out in the finals when she misspelled the world "exochorion," said there's a lot she'll be bringing back to Abilene, Texas. "I will take home with me a suitcase full of happy memories, great friends and a true feeling of acceptance," she told ESPN. And she didn't hesitate when asked what her next move would be. "I don't need to study spelling anymore, and I don't really need to sleep anymore," she said. "So I'm going to go home and watch every horror movie on which I can get my hands."